Hardback. 1st US Edn. For 40yrs, Dannie Vale kept his mouth shut about one of America's most brutal, unsolved murders - a case at the time, still on the FBI's "active list". He now tells all. 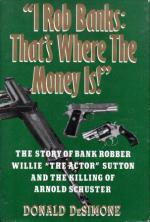 In 1947, the 20th century's most notorious bank robber - Willie "The Actor" Sutton - made his third escape from prison. Driving the getaway car as it sped from Philadelphia's Holmesburg Prison was Sutton's longtime lover. Also in the car was a "borrowed" 10yr old Dannie Vale, who was fated to cross Sutton's path a few years later. By 1951, Sutton had made so many unauthorised withdrawals from what he called "money stores" (banks) that he became the "Number One Most Wanted Man in America," with a $70,000 reward on his head. Meanwhile, Dannie Vale was being sexually molested by his mother and aunt, and grew into a troubled teenager whose felonious and sexual adventures rivaled those of hardened criminals three times his age. In 1952, Willie Sutton was spotted on a Brooklyn subway train by 24yr old Arnold Schuster, who followed Sutton and hailed a police car. "Lucky" Arnold Schuster became known as "The Man Who Spotted Sutton" - but the glory-seeking hero enjoyed his fame for only 19 days. Mob hitmen mercilessly gunned him down in the streets of Brooklyn after using Dannie Vale to inadvertently "set up" the unsuspecting Schuster. The murder was carried out in an unusually vicious and sadistic manner to teach "squealers and stoolies" a lesson they'd never forget. Public outrage was immediate. Police and legal authorities were forced to conduct an unprecedented international manhunt for Schuster's killers. The results were fruitless. The murder of Arnold Schuster remained unsolved and on the FBI's active list - until the publication of this book. Now the author breaks Dannie Vale's 40yrs of silence and finally solves the murder of Arnold Schuster. These compelling revelations of Vale's most intimate secrets, and his expose of the identity and motives of Schuster's killers, make dramatic reading. With Epiligue. 361pp. lge. 8vo. h/back. Vg+ in Vg. dw. A fairly heavy book which will require additional postage if shipped overseas.